After the hectic summer months, the intense lunar eclipse energy and a multitude of planets in retrograde we find ourselves in a reflective state, which for many of us has felt a little too intense. So time for some grounding work and as we stare into the change of the seasons from Summer to Autumn what better way to this than to go outside. Or as the title says bring the outside in, for example we can use a walking form of meditation and go forest bathing. In our Red tents we can also utilise this practice of going outside and bring our sitting in circle from the inside …out whilst reconnecting with nature and our inner feminine spirit. This can be in a forest, by the coast or in the countryside. Going barefoot helps us to reconnect and literally ground ourselves with the soil / grass directly underfoot. Our ‘Sitting in Circle’ piece comes from Katherine this month as she tells us about her outside adventures. Sitting in circle piece written by Katherine Armitage of Earth Sisters Gathering – their red tent based in North Devon, Holwell Farm. Earth Sisters Gathering was set up by Georgia Palmer to hold weekly gatherings for the women of North Devon (or further afield) and share earth based skills, conduct ceremonies and meditations in nature. 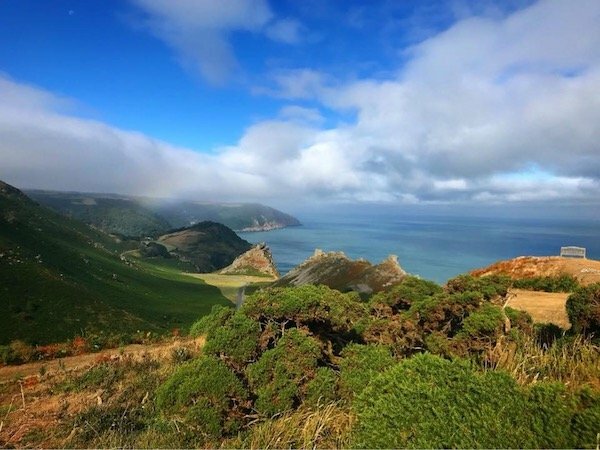 We have been out in nature a lot, over the summer, connecting with Mother Earth through meditation and tuning in to natural features, such as the amazing rock formations in Valley of the Rocks. This area is so powerful and has long been associated with the Druids, who built many stone circles here. Now, most of the stones are lying on their sides or hidden and according to 18th Century writers many were taken to make gateposts. However, the energy of those that remain can be felt tangibly and we all picked up on this when we did a silent walk in the Valley a couple of weeks ago. Georgia says about the group: “My aim is to create a held space where we can feel open, honest and bond as sisters whilst rekindling our inherent nature of deep, raw connection to Mother Nature. I would love everyone to feel free to express themselves and share what we all have to offer… to build a strong and stable network of women making a difference to the community and planet! Earth Sisters is a coming together of women to uncover our roots and connect with the land and each other”. The structure of the gatherings is very fluid, following how everybody feels in the moment. We aim to get outside in all weather.